Oo yum! 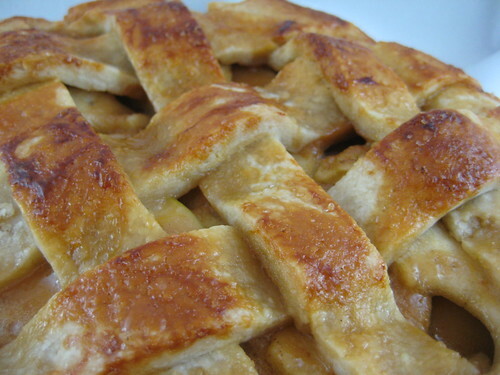 I made a caramel apple pie last year but I am always up for new recipes! Is it me, or is something missing in the recipe? I don’t see when the cream or salt should be added for the caramel, nor do I see the bitters listed in the ingredients for the filling. Okay, I made the pie the day before Thanksgiving. Looks fabulous and I think it will be a hit tomorrow. My prob–refrigerate or leave at room temp overnight? Thanks! I was worried that the caramel filling would become too gooey, but I’ll stick it in the fridge. Can’t wait to try in tomorrow!! Nah, it will be fine. I think you could heat it up in the oven for a bit too if you want it warm. Let me know what you think, happy Thanksgiving! Okay, the pie was a total hit! Love the recipe. We refrigerated overnight, then re-heated at dessert time after turkey and dressing. Served it with vanilla ice cream. It really was the perfect apple pie! The only thing I would change would be our timing. I think the pie would have been slightly better served right after cooking and cooling the same day. But, isn’t that the case with any pie. The recipe itself was just right. Thanks so much!! This looks like a fun new recipe i’m hoping to try out with my daughter tonight.